April 9th: Letchworth (& friends) at Wimbledon 7s & 10s tournament. Following a significant number of "no shows" from across the county its going to be up to Letchworth, Saracens, Ampthill and Rachel from Welwyn to represent Hertfordshire on 9th April at Wimbledon RFC. We (the county) are entering two sides - a "ten" in the U17 competition, and a "seven" in the U14s. Overall about a third of the players will be coming from each of the three clubs in what should be a challenging, and somewhat unpredictable event. Unpredictable because this is also a regional day. Our regional girls will be up in Coalville (Leicestershire) to take on the might of East Midlands and Yorkshire, and the same applies to the other county teams we will face - their regional representatives will also be elsewhere. In addition, of course, its the Easter holiday so even more girls will be away on familiy holidays (including our own Katie and Nikki, not to mention Sophie). Hopefully we'll have the county kit to play in - I have asked but with only a week to go before the tournament bringing your Letchworth shirts would be a good idea. Just in case. For those with GPS systems in the car the address is: Wimbledon Rugby Football Club, Beverley Meads, Barham Road, Copse Hill, Wimbledon, SW20 OET. For everyone else the suggested route seems to vary a fair bit dependent on which system you ask - so can make your own choice. In practice the ground is just off the A3 almost surounded by the Royal Wimbledon golf course. Follow M4 east into London until it peters out and becomes the A4. After a mile and a half bear left onto the Coombe Lane ramp, then left into Coome Lane, the left into Barham Road. The club is at the end of Barham Road. Journey times and travel distances (from Letchworth) vary, but circa 50 miles and about and hour and a quarter would seem reasonable. More details about this competition when we get them. Start time is 1.30pm so those going from Letchworth to meet at the club with the aim of departing at 11.15/11.30am. The aim would be to arrive by around 12.15/12.30 to give time for girls from the three teams to get to know each other, work out who will play where, etc. It also allows time for people to get lost etc. on route! We are to be awarded a grant of £2,650 from a body called the "Local Network Fund" (or more specifically the Hertfordshire bit of it). We actually only have a few weeks to either spend it, or have some firm itemised plans for spending it. But the main thing is its ours - for girls' rugby - to spend as we see fit. It cannot be spent on the general club. Very easy to find, especially if travelling from Letchworth! From North/South use M11, exit Junction 8 (A120) . Kick-off 11.00. Depart Letchworth 9.30. Well, even though you did not win on sunday I think that you all put in very good performances and I am not just saying that, you know I tell you if you muck up! The game was close and if we had a complete squad, I think that we could have won, but things dont always go our way like loosing most of our forwards! The performances overall went well and you all played better than i have seen in a while, you were taking chances and pushing them back. The positives of the game make me very optimistic about a good herts 7 team being formed. some of the less polite teams that we play, who dont seem to understand that it is a game we are all playing (well done Jess for not lamping the opposition on sunday) I am also going to closely examine my rule book about shouting down the opposition as i like the effect it had. I am looking forward to sorting a very strong team out for the herts 7's. We have a squad of approx 10 girls to choose from which will make it important to turn up to training sessions. On 14th May we're going to be hosting one of the biggest girls' rugby festivals ever. Certainly in East Region. Up to 26 teams from eight counties are now expected - including (and the U17s will be pleased about this) Thomas Beckett. Indeed I think I'm correct in saying that nearly every side we've played this season will now be taking part (the exceptions being Mid Warwickshire, Sudbury, and Bishop's Stortford). Full details of who we're expecting can be found on the Herts 7s website. Well done to all girls that played on Sunaday. A vital training session this week as we will be preparing for the Bishops Stortford game this Sunday. A reminder that if we get enough numbers on Sunday the plan is to have two games. 1 full 15-a-side game (or however many turn up) likely to be 12-a-side, and one 7-a-side game in which myself and John will look at different combinations running up to the 7's tournament. Look forward to seeing you all on Sunday, lets have a good turnout. First, all in all there are about 14 of you in the U17s who turn up reasonably regularly. Now, in most games our aim is to give as many of you as much rugby as possible. Strangley enough I put participation above the actual result - to coin a phrase, its not about the winning its about the taking part. But the Sevens is not a friendly game that everyone will have forgotten about tomorrow. Its a Big Thing. And we want to do as well as possible. So we want to field the strongest side we can. If the team is winning, we want to keep that winning team on. Fielding a radically different team in each match, thus causing confusion, losing any momentum we may have had, and so on. We tried it at Youth Games 2004. A team containing Ruby, Hayley, Katie, and Nichola finished last. End of lesson. Now, I don't want any of you missing out on the 14th so the only way around it is two teams. And, as Saracens will be bringing some U17s with them, we will definitely have just about enough for two squads - Letchworth (whatever) and Letchworth Saracens. Note that if you are in the latter team you'll still be playing in Letchworth colours and will be expected to perform accordingly. Also, if anyone is injured, one team could feed the other. The rules will permit this - I know 'cause I'm writing them! And finally" Letchworth Saracens" gives us 12 teams. You try to structure a tournament with 11 teams in it...! Could everyone please try to bring a reasonably clean top and tracksuit bottoms with them to games (or, if you insist on warming up in them, two tracksuit bottoms). Yesterday at Daventry we coaches got it in the neck again (and if you think you get moaned at a lot you don't know the half of it) because some girls were eating in the clubhouse in their muddy kit. You know, usual thing - end of the world, collapse of civilsation as we know it, caretaker handing his notice in as we speak, didn't happen in my day, etc. etc. Fortunately for me, none of you lot were involved - but this was because as you were either hanging around outside or had grabbed your food and gone. So look, its not as if I am not asking that you do anything heinous like having a shower (heaven forbid! ), just have something with you to pull on over the grime. Please? A pleasent enough afternoon for once - not too hot, not too cold. Still, the defence held up well, Nim's defensive kicking was okay (though hitting touch more often would have been nice) and Hayley finally broke the deadlock at the end of the first half to give us a 12-5 lead. After that I had to go off and ref the U14s, but a final score of 38-12 (five tries for Hayley) shows that things continued to improve in the second half. Still, Hayley says the rucking wasn't too hot and the opposition were getting through too many tackles before being brought down. The U14s - with their continuing injury problems - also borrowed, two from Daventry and two from Newbold, to take on Newbold. The U14 game on 2nd April - which was due to be against Chesham - is now cancelled and, unfortunately, we haven't been able to arrange an alternative game given the short notice. However that does mean Rachel can have a full training session with you all for the first time in... ages. This will be the start of the U14 bid for the Sevens, so please all try to be there. On the subject of Sevens our ranks at U14 will be bolstered for the event by the addition of Mishka Mayers, a regional player from Sudbury who will be coming with Sasha who will be playing for our U17s (Sudbury were unable to enter as a club, unfortunately). The U14 competition at Sevens will now have nine teams including Holt from Norfolk. See the Herts 7s website for more information. 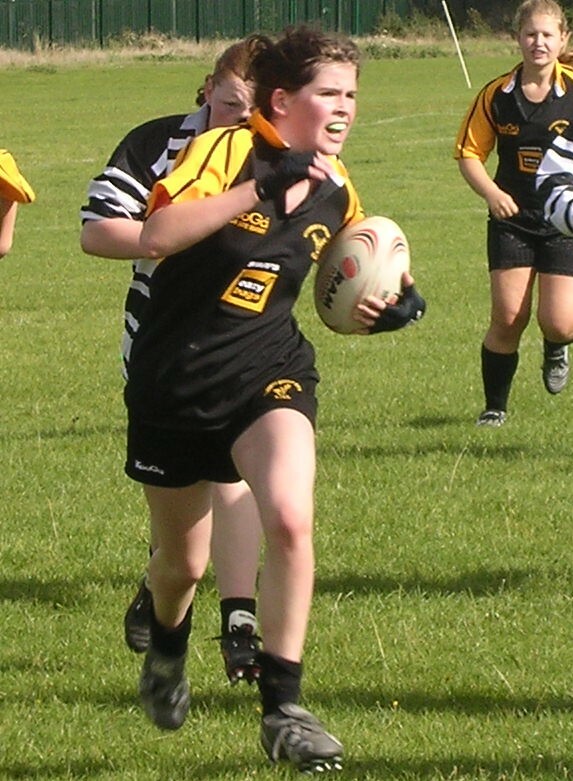 Finally we have around 12 girls for the U11 tag who will be training alongside you on Sundays from 23rd April. Its important to make these girls as welcome as possible as - if all goes well - they could form the core of the U14/U15s for the next few years. A couple are from Codicote - so realistically will end up at Welwyn (look at a map!) - but the rest are all from Hitchin, Letchworth and Royston. As we discussed on Wednesday, we are effectively entering two sides on the 14th, one on our own and one in combination with Saracens. The latter is currently listed as "Nomads", but as its just us and Saracens (well, mainly) it strikes me that calling the side "Letchworth Saracens" might be neater. In which case - what do we call the other team (to avoid confusion)? Letchworth Does (you know as in "Doe a deer, a female deer"). Err..... no! Letchworth Harts Hmmmm... no sure about that. What do you think? Letchworth Muntjac 'cause that's the sort of deer we have in Letchworth! Okay, maybe not. A very important training session tomorrow as we look to build 2 teams to enter the Hertfordshire 7's (7 weeks to go). Planning to look as a team at our defence and then with the forwards theclearing out of rucks and the backs will look through their moves similar to last week. Everything we do between now and May 14th must be done together as a team soplease nag everybody and lets get a good turn out at tomorrows trainingsession. It would be much appreciated if we could have as many people on time ( 6.00) as possible as we are likely to have a 5-10 minute meeting prior to thesession so myself and John can let you know our thoughts running up to theend of the season. Please email myself or John if you have any problems and please let us know if you can't attend training. Some familiar faces have sneeked into the SportMatters photos of the internationals at the weekend (see link to Sport Matters in the bar on the right). In between the pictures of the exploits of the England A team in their game against the Nomads there's a snap of some familiar faces, who appear to be selling health insurance. 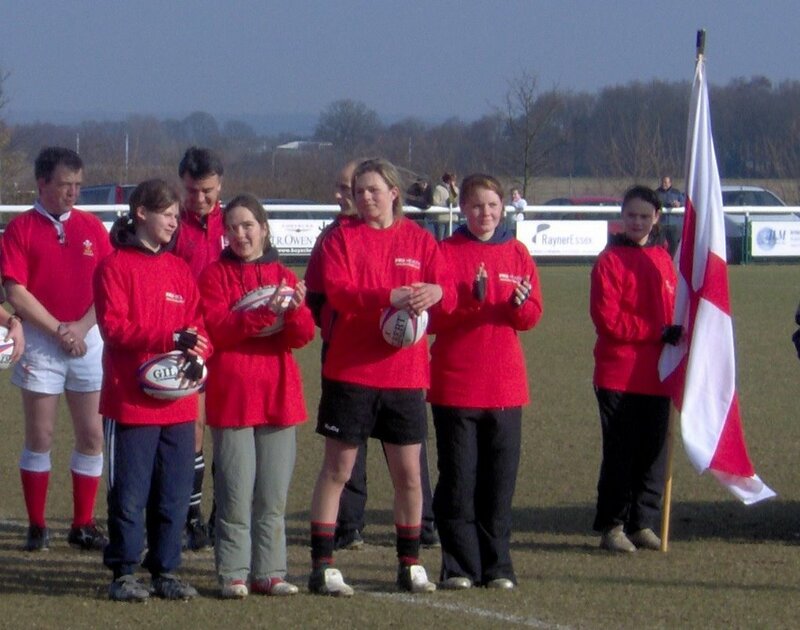 No pictures from the girls games this time - so far (the U14s did get some coverage for their game in January), and no shots of the line up before the game either - so some of you haven't seen Chloe with the flag, plus Mel and Katie lining up with the teams. So here they are! And again - this time with the whole England team, the Six Nations Trophy, and also Sasha - who seems to be lined up some distance away for some reason. Not talking or something? This is clearly the month for launching websites. Nikki Alcock, our U14 captain and scrum half, has launched a pull-no-punches guide to Letchworth girls from the player's point of view (see the link on the right). An impressive bit of design (though the musical taste is a shade ... individual, and one might question the male rugby players being used as a masthead) it includes reports, photos, opinion polls, and a heap of other interesting stuff. Take a look, and leave some feedback. On the photo front, and inspired by Nikki to do something about it, you will now find a link on the right to a cavalcade of images from the past couple of years. Enjoy! Follow M1 north to Junction 16. The A45 west towards Daventry (about 7 miles). At 1st roundabout (hotel on left) take 2nd exit at filling station. Turn left the Club Entrance is 50Mts on left. Distance: 55 miles. Journey time: About 1 hour. U14s: Unless you are in the regional squad you have the weekend off! Some thought had been put into havig some county trainng on Saturday before the internationals at OAs, but probablems casued by the recent rain and the the state of the ground has meant that this has had to be cancelled. But please come along to the internationals if you can, and also come along and cheer on your team-mates in th regional games on Sunday at Harpenden. Internationals (Saturday): U17s arrive at OAs at 10.30 for sorting into teams, sorting out who will be ball girls, flag-bearers, etc. and general warm-up and training. The official programme starts are around 11.30, and the day should end with England being presented with the Six Nations Trophy at around 5pm. Remember to bring warm clothing, drinks and refreshments! Regionals (Sunday): Regional girls should have had your instructions from Region. For everyone else coming along to watch, the kick-offs are at 12.30. Well played by everyone on Sunday. Obviously we still have some way to go compared to Welwyn (an average of two years older per player, with two-three years more experience), but equally we are gradually catching up. Its the first time I've really been able to see the U14s and ultimately I think the problem you when facing teams like Welwyn is that you lack of big, strong, disciplined, forwards who will concentrate on winning and keeping the ball for the backs. Without that even the best back line will struggle - but we will get there. Hayley, Izzy, etc will grow into the roles - but it'll take a bit of time yet! The main thing is that you did not give up and seemed to enjoy and learn from the day. Which is the what its all about. The U17s also struggled a bit against Welwyn - but the difference was really only a couple of very fast, talent Welwyn backs. Up front again it was a very even battle. You showed more of what we are capable of in the game v Bishops Stortford. Given just a bit more room you were pretty devastating. But the main thing to pass is a comment from Sudbury (which has been copied to Dave Roberts and Karen for the newsletter, so that the wider club knows as well). Sudbury (and Stortford) had a excellent day and their coach told me that they were asking if there was any way they could play with Letchworth more often (the U17s combined with Sudbury for the day) as they had got on so well. The fact that I get a team ringing up asking if they can play you almost every week must be linked to that. Most girls teams say how difficult it is for them to get fixtures - but clubs are queueing up to play you. We may not win every game - with relatively young sides at both age groups we are probably a little under 50% this season - but you are clearly winning a reputation as being one of the friendliest, most welcoming, and most sportsmenlike teams in the region (and beyond). Sometimes teams put winning above all else. They make headlines, win trophies... and wonder why their fixtures start to dry up. That is not a problem we face. The reputation you are building will last longer (and will be more valuable to the club) than a few results here and there, and its something to be very proud of. The idea behind this "blog" or news website is that - in addition to sending news and information out via email - it will also appear here, along with updated fixture lists, membership forms, and the so on. So no need to trawl through piles of back emails in order to find out something or other - it'l all be here. Also - if you don't get the emails (for whatever reason) - by regularly checking this site, or by subscribing to it usig Google Personal Page or any similar service, you can also keep up-to-date. It also gives everyone a chance to reply or discuss anything, or make suggestions relevent to girls' rugby at the club, or beyond.